Factoid: There are more than 5,000 varieties of wine grapes. The Muscat Blanc grape is thought to be the “alpha” or oldest grape, with centuries of documented history around the Mediterranean. It is used primarily for semi-sweet and sweet dessert wines. The Muscat of Alexandria is another ancient grape grown in Mediterranean climates, although wines produced from it are considered inferior to Muscat Blanc wines. Muscat of Alexandria grapes grown in California are used primarily for raisins. Muscadet (or Muscadekke) is one of the white grapes grown in Bordeaux. It has a grapey flavor, but is not related to the Muscat grape. The best-known Muscadet wines are the sweet Tokays produced in Australia. 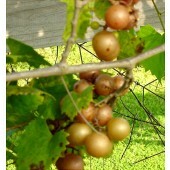 The Muscadine (Muscadinia) grape is a separate branch of known vinifera (see note below) grapes. It is a hearty species with large fruit with thick skin that grows primarily in the southeast US and Mexico. The September Oaks muscadine vineyard includes the Noble and Carlos varieties, which are primarily wine grapes. We also grow Doreen, Magnolia, Tara and Triumph varieties that may be used in wines, but also make good eating.